Subject: Guidelines regarding handling of complaints in Ministries/Departments. The undersigned is directed to say that instructions regarding dealing with anonymous and pseudonymous complaints were issued vide this Department's Office Memorandum of even number dated 18.10,2013 prescribing that no action is required to be taken on anonymous complaints, irrespective of the nature of the allegations and that such complaints need to be simply filed. Subsequently, the said Office Memorandum has been clarified vide Office Memorandums of even number dated 18.06.2014 and 31.03.2015. In this regard, the Central Vigilance Commission's Circular No.07/11/2014 dated 25.11,2014 may also be referred to. A copy each of the DOP&T's aforesaid Office Memorandums and CVC's Circular are enclosed herewith. 2. The instructions contained therein are reiterated and all Ministries/Departments are requested to follow the same while handling complaints received in their respective Ministry/Department. 1. All Ministries/Departments as per standard circulation list. 2. Secretary, Central Vigilance Commission. 3, Department of Public Enterprises. 4. All Desks/ Sections of DoP&T. 6. DoP&T Cell for placing a copy of this OM on the website of the Ministry. 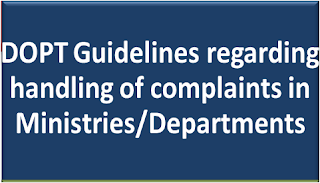 Subject:- Guidelines regarding handling of complaints in Ministries/ Departments. The undersigned is directed to say that the instructions regarding dealing with anonymous and pseudonymous complaints as contained in this Department's OM No. 321/4/91-AVD,III, dated 29th September, 1992 and as reiterated vide DOP&T's OM No. 371/38/97-AVD.III, dated 3/11/1997, being at variance with instructions issued by CVC in this regard vide circular No.3(V)/99/2 dated 29th June, 1999, No. 98/DSP/9, dated 31st January, 2002 and 1 lth October, 2002, had been receiving the attention of the Government for the past some time. 2. The matter was examined afresh in consultation with the Central Vigilance Commission. Subsequent to the Public Interest Disclosure & Protection of Informers' Resolution - 2004 (PIDPI), the Commission has created a mechanism for handling complaints where identity of the complainant is kept secret and the complainant is provided protection. This has been endorsed and operationalized by the Central Government with the approval of the competent authority. (i) No action is required to be taken on anonymous complaints, irrespective of the nature of allegations and such complaints need to be simply filed. (ii) Complaints containing vague allegations could also be filed without verification of identity of the complainant. 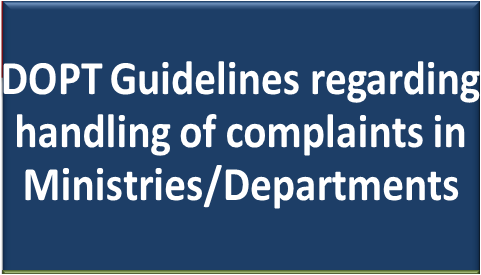 (iii) It a complain contains verifiable allegations, the administrative Ministry/ Department may take cognizance of such complaint with the approval of the competent authority to be designated by the Ministry/Department as per their distribution of work. In such cases, the complaint will be first sent to the complainant for owning/disowning, as the case may be. If no response is received from the complainant within 15 days of sending the complaint, a reminder will be sent. After waiting for 15 days after sending the reminder, if still nothing is heard, the said complaint may be filed as pseudonymous by the Ministry/Department. 4. Instructions contained in para-3 above would also be applicable (with appropriate competent authority to be designated under para 3 (iii) above) for dealing with complaints against Secretaries to the Government of India or Chief Executives / CMDs / Functional Director of PSEs/PSBs/F1s, which will continue to be referred to the Cabinet Secretariat for placing before the Group of Secretaries headed by the Cabinet. Secretary/Secretary (Coordination) in the Cabinet Secretariat, as the case may be, as per procedure given in Department's OM No. 104/100/ 2009-AVD.I, dated 14/1/2010 and DPE's GM No. 15(1)/ 2010-DPE(GM), dated 11/3/2010, as amended from time to time. 6. NIC, DOP&T Cell for placing a copy of this OM on the website of the Ministry.